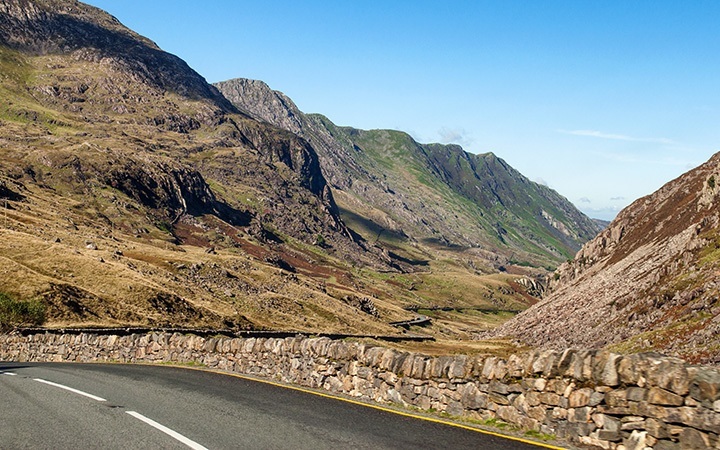 Snowdonia road trip – is this Wales’ most scenic drive? As Wales’ first National Park and the third most popular National Park in Britain, Snowdonia is something special. 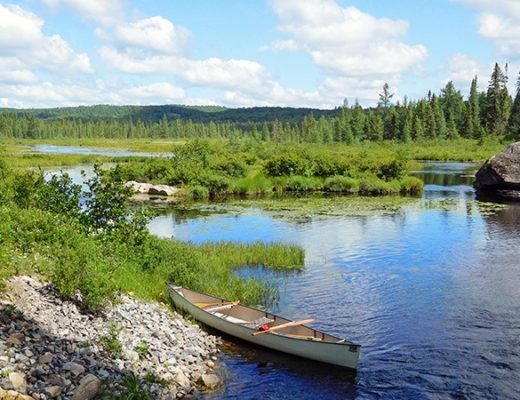 It stretches over 827 square miles full of unspoilt scenery with rocky mountains, clear blue lakes and thick forests. It has plants and insects you won’t find anywhere else in the world. And at the heart of it is the peak of Snowdon, the highest mountain in Wales. Or so I’d been told at least – the first time I’d visited you could barely see a metre in front of you through thick fog and drizzle. So when the last day of our weekend trip to North Wales dawned blue and bright, it was perfect excuse for a scenic Snowdonia road trip. 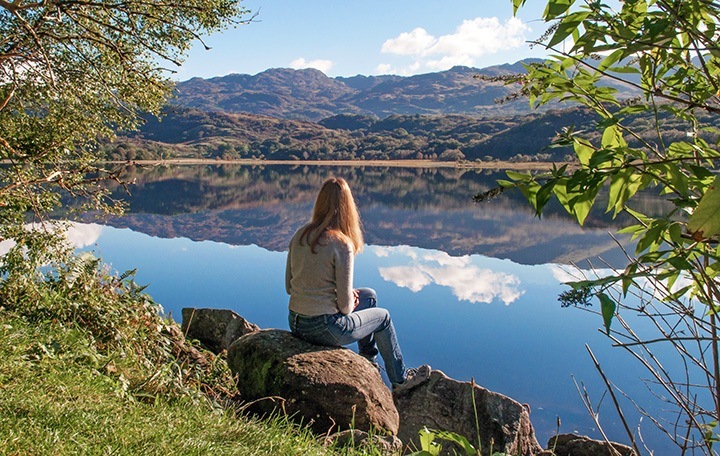 When the sun shines in Snowdonia, you have to get out there among it all – however you can. Ideally we’d have had a couple of days to climb Snowdon and hike in the mountains, or even half a day for a shorter walk. But all we had was a car and a few hours. After a bit of research I came up with a road trip through some of the park’s most scenic drives. So if you’re limited on time – or not much of a walker – you can still get a taste of Snowdonia’s beautiful scenery. The route covers 39 miles altogether and takes around 1.5 hours to drive (depending on how many photo/tea and cake stops you make along the way). Our route started in the town of Porthmadog on the North Wales coast. This was our base for the weekend, and it’s also the hub for the West Highland and Ffestiniog railways and is close to the quirky Italian-style village of Portmeirion. From Porthmadog we followed the A498 past the village of Tremadog and on through the Aberglaslyn Pass to the town of Bedgellert. The road carries on through the forest and along the banks of Llyn Dinas lake. This 60-acre lake is home to salmon and trout – and possibly even the throne of Britain. Legend has it that the ancient British king Vortigern hid the throne under a great stone by Llyn Dinas for safekeeping and it’s still there somewhere. If you fancy taking a look there’s a mile-long path around the lake. We drove on around the edge of Llyn Dinas and it wasn’t long until we came to an even more beautiful lake – Llyn Gwynant. On a calm, still morning the lake was perfectly flat with the mountains, blue sky and white fluffy clouds above reflected like a mirror (well at least until a dog jumped in for a swim – if it wasn’t about 10 degrees in the water I might’ve been tempted too). The start of autumn is a gorgeous time to visit Snowdonia with a mix of green, gold and red shades everywhere you look. 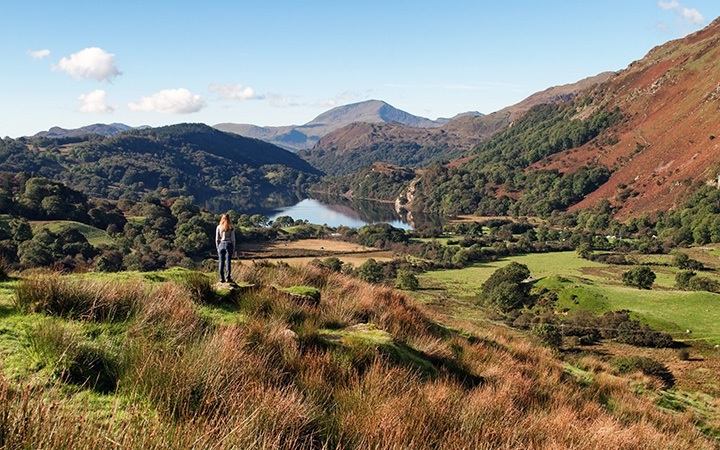 The road follows the Nant Gwynant river from the lake and climbs 600 feet upwards in just two miles. At the top there’s a viewpoint where you can stop off and take a look back down to the lake (where the image at the top of this post was taken) and over towards the Cwm Dyli hydro-electric power station. At the top of Nant Gwynant we took a diversion to the left on the A4086 to the Pen-y-Pass. This is the start of three of the main walking routes up Snowdon. The car park was packed with hikers getting ready to start the climb up – and the café was full of others who were celebrating getting back down. The road up here started life as a miners’ path in the 1830s which was used to transport copper ore from Snowdonia down to Llanberis. It still winds the same way downhill to Llanberis. This is where catch the Snowdon Mountain Railway to the top of the mountain if you don’t fancy walking. Or where you start the Llanberis Path if you do – it’s the longest but least strenuous walk up to the summit which runs next to the railway line. There are a ton of other outdoor activities too like mountaineering, climbing and mountain biking, as well as diving in Llyn Padarn lake if you’re feeling brave. From Llanberis we backtracked to the Pen-y-Pass and then followed the A4086 over the hills past the grey slate cottages in the village of Capel Curig. Then from Capel Curig we took a right onto the A5, heading towards Betws-y-Coed on the edge of Snowdonia. The road gets flatter here and there are more trees and less mountains. 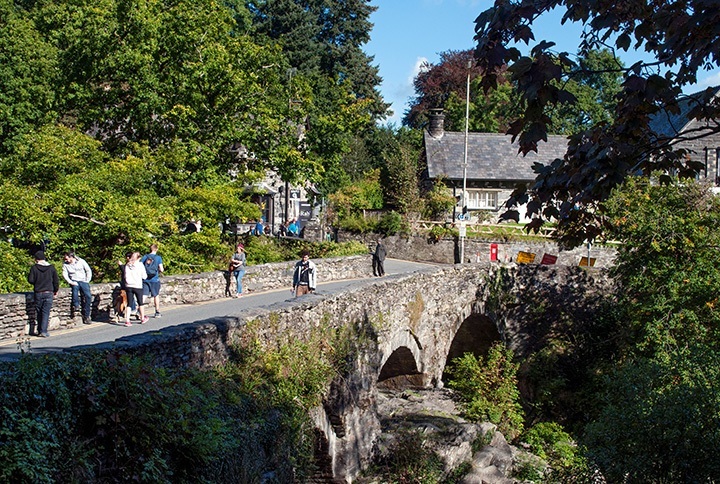 Betws-y-Coed is another hub town, and a former coach stop on the Irish mail route from London to Holyhead. It has a pretty village green surrounded by shops, hotels and an old church. You can visit the Miners’ Bridge and walk along the riverside or out to the Pont-y-Pair and Swallow Falls waterfalls. Then replenish some calories with Welshcakes at Cwmni Cacen Gri. The road out of Betws-y-Coed leaves Snowdonia, but if you’ve not had enough beautiful scenery by now there are a couple of different directions you can take to continue your Welsh road trip. Go north along the A470 and you’ll reach the medieval seaside town of Conwy. It has 13th-century Conwy Castle, city walls to walk around and the UK’s smallest house to squeeze into. Or you can head south on the A5 towards Llangollen and the Pontcysyllte Aqueduct. The aqueduct is a seriously impressive piece of engineering, which was built in 1805 to carry the Llangollen Canal over the River Dee. 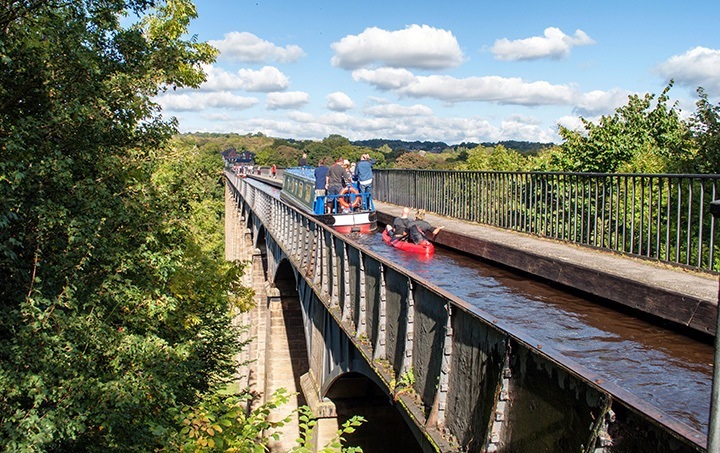 At 38 metres high up it’s Britain’s longest and highest aqueduct, which is just wide enough for one canal boat. You can take a boat trip across or walk along the towpath across the aqueduct for even more spectacular views. If you’re navigating using a GPS/sat nav, then you can input the following postcodes to follow the route. From Porthmadog, navigate to LL55 4YD (Bedgellert) > LL55 4NT (top of Nant Gwynant) > LL55 4TU (Llanberis) > LL24 0EN (Capel Curig) > LL24 0AE (Betws-y-Coed station car park). Then you can carry on to Conwy (LL32 8HT) or Pontcysyllte Aqueduct (LL20 7TG). Wow, it’s stunning! I’ve never actually made it to Snowdonia. 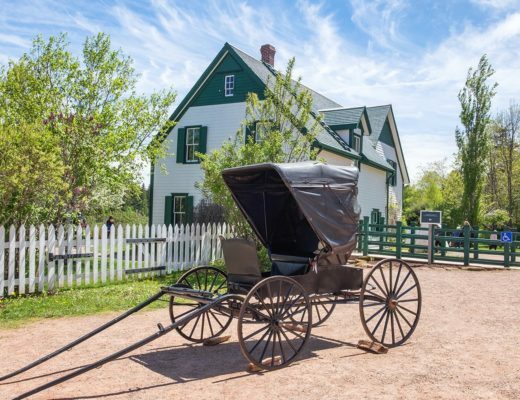 It’s so beautiful – especially when the sun makes an appearance! Thanks, it’s a gorgeous area! Ohmigosh stunning! You’ve just reconfirmed that I need to take a trip out that way ASAP! You do! Hope you get to make it out there sometime soon. That aqueduct looks so cool! I’d love to do a road trip of Snowdonia. Great isn’t it – watching the boats go over had me thinking about doing a canal boat trip sometime! Agree with most of your roue, some terrific places to see, but if you’ve got more time, stay in Dolgellau, take the A470 to Llaneltyd, then the A496 to Barmouth, great coastal town with incredible iron bridge, then follow the road along the coast, past Harlech Castle, cross the new Bont Briwat bridge to Penrhyndeudraeth, pass Portmerion and cross The Cob to Porthmadog, do the route as you’ve got it, then from Betws-Y-Coed take the A470 back down to Dolgellau, taking in Dolwyddelan Castle, Trawfynydd Power Station and lake and Coed-Y-Brenin forests. Takes a little long, but well worth it. Great tips thanks – I stayed in Barmouth last year and explored the coast down around Harlech so a good idea to combine the two! Sounds great – one for next time for sure! Beautiful scenery – I hope to visit Wales someday! That aquaduct is quite unique, I’ve never seen anything like that! The aqueduct was amazing – I’d like to go back and take a boat trip over it next time, the views were fantastic! What a great post thanks! I’m going there in a couple of weeks and hadn’t even thought of doing any driving through the National Park. You’ve just made me rethink my whole itinerary! I too only have a few hours to explore. I plan to tweak your route slightly to go from Llanberis to Anglesey and then back to Conwy as that is going to be my base for the 2 days I’m there. Thanks again. I always enjoy reading your posts as they have inspired me to visit more of my home countries! Hope you have a fantastic time – I’d like to go and explore Conwy properly next time, and its been years since I was in Anglesey too, so much to see in that part of the world! I haven’t been to Snowdonia for a while, but you’ve reminded me of how beautiful it is. I really must get back there soon. It’s a beautiful part of the country – though if only the weather was guaranteed to be like that every time! wow amazing pictures! I have never heard of Snowdonia. You did it in one day? We did! We were staying nearby so got an early start but if you want to do some of the walks I’d recommend a couple of nights there. Next time I’m definitely going to make sure we’ve got time to do some walking! Driving is a lot easier! I must try the climb up Snowdon at some point though – but maybe not in November! That looks so beautiful Lucy. I’m ashamed to say I had no idea. Snowdonia is now on my bucket list! Great photos by the way. Thanks, we had such a beautiful day, couldn’t have hoped for better! So much beautiful scenery in Wales (though like Scotland you take your chance with the weather!). You missed out visiting Abbey House in Llandudno – its a great B&B if you are heading out into Snowdonia :-)… and for those on a road trip we have our own off street parking! I didn’t get chance to make it to Llandudno this time, but thanks for the tip, I’ll be back sometime for sure! I’m definitely on a mission to see more of our home nations in 2017, and this has just reinforced that sense of purpose – such treasures so close to home, eh? Certainly are – I’m hoping to see a bit more of Scotland next year, and the Cotswolds which are practically on my doorstep! Great article! Such a beautiful place like a paradise, I will pin this for sure for my future reference. Thanks. Thanks so much, hope you get to make the trip someday! Looks like a Fairytale! Thanks. Would this route still be possible in January? Hi, yes it should be fine – the highest likelihood of snow is late Jan/early Feb but the main roads are usually gritted or cleared if there is snow or ice. Thanks. It looks a great route. 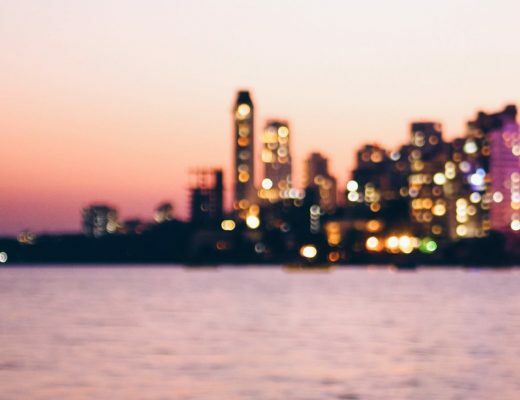 Hi Lucy, travel blogs like yours are so helpful for overseas visitors. I’m an Australian from Melbourne, but my ancestors are Welsh. I know I need to see Wales, and to feel it, as I’ve carried that deep heritage all my life. But I will only have 2 days and have decided the Wales I want to see is Snowdonia, and wondered how much I could cover in 2 days. Thanks so much for sharing your experience, it will be very valuable. I’m going in August – is that high Summer? So glad it was useful – and hope you have an amazing trip. August is summer in Wales but the weather does change a lot here so you might need a waterproof or an umbrella too! Ooh thank you I’ll update it. And yes, all those Welsh holidays I did as a child taught me that Wales does like its weather! Many thanks! Did the trip from Dolgellau today and it was absolutely amazing! That’s great – so glad you enjoyed it! Definitely! I’m updating some posts and adding maps at the moment so this will be one of them for sure. I will be in the UK in June 2019 and as part of that trip, I will be in Liverpool for 2 days. SInce Snowdonia is not very far from there and is so beautiful. I would like to know a couple of things. 1) Where to base myself if I am planning to spend 2/3 days in Snowdonia. 3)How much time will it take to do the road trip you have created on the map? 4)How do I fit the heritage train trip in this? Hi there, the road trip only takes around 1.5 hours of driving but add on a bit extra for photo stops. There isn’t much walking other than a few short sections to viewpoints so it should be fine with a small child. If you want to do the West Highland or Ffestiniog steam railway then Porthmadog is a good place to stay – it’s the starting point for both the drive and the trains. Have a great trip! 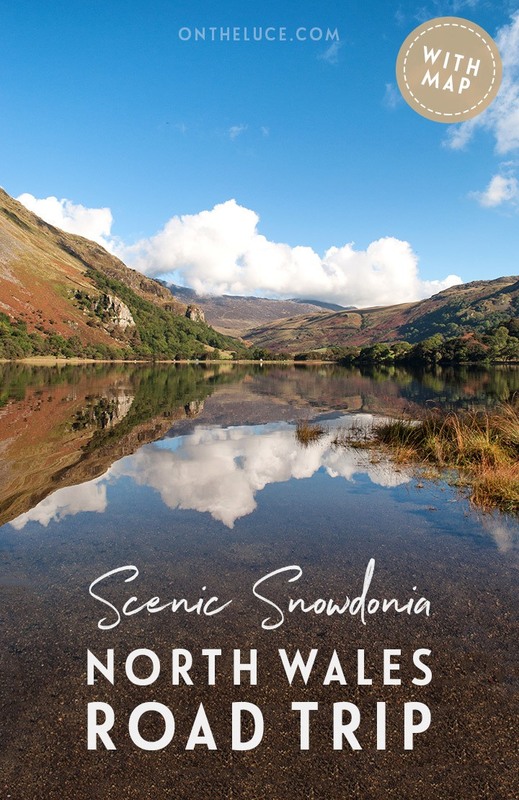 Just come across this after a Google search of nice scenic routes in North Wales as I’m taking a drive up from London with my wife and baby. Really looking forward to it, and even more so now after having a read! Thanks! Hope you enjoy the drive, it’s such a lovely part of the world! 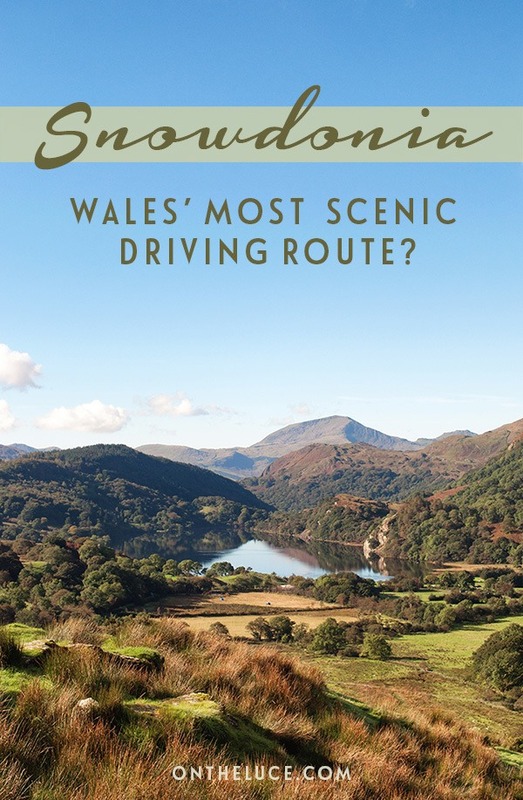 Hi There: I am planning a trip to Snowdonia and North Wales by road. Not sure if it’s doable or practical, but planning to take the train from London to Liverpool (spend a day doing Beatles stuff) and then rent a car to Wales. Forgive my ignorance but am from Toronto, Canada and looking for some guidance/advice. We have approx. 5 day (April 30th to May 4) before returning to London, for onward flight back to Toronto (late Saturday night or early Sunday morning). Given the no. of days, would you be able to suggest what would be the ideal route to take? Also, planning to drop off the car in Wales and take the train back to London.. Thanks in advance. Amazing! Have done North wales 6 years ago.. stayed up in Llandudno and we did the Great Orme cliffs and Snowdonia! Truly scenic place. It is gorgeous around there!